Providing a positive experience at every stage of the customer journey is crucial to retaining customers and ensuring a growing business. Aladdin offers a superior experience by empowering merchants/e-Commerce platforms to price goods in multiple currencies without exposing any parties to foreign exchange risk. Cross-border customers can now view and purchase goods and services in their home currency, while merchants/e-Commerce platforms offer price certainty with Aladdin’s guaranteed FX rate solution. Additionally, Aladdin allows configuration of a spread, creating a new revenue stream for merchants/e-Commerce platforms that would otherwise be captured by other parties in the payment processing chain. Set prices in your customers’ home currencies to increase sales conversion rates. 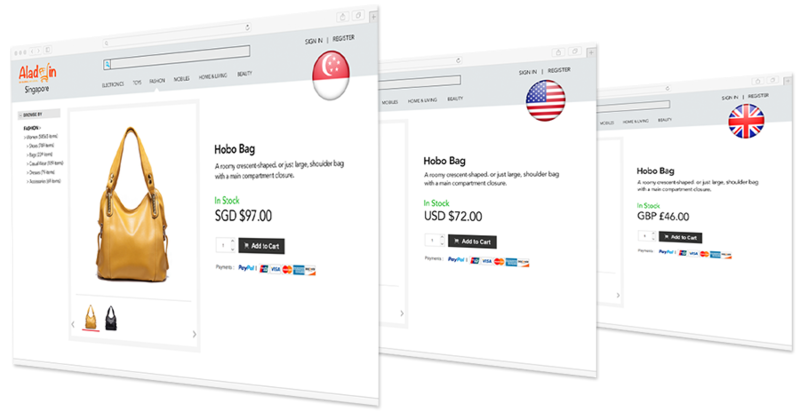 Reassure your cross-border customers by securing the exact value of their purchases at the point of checkout, reducing buyer hesitation and cart abandonment. Link your e-Commerce platform directly with Aladdin and have tight control over your pricing and margins. All trades, regardless of size, are confirmed electronically. Settlement becomes seamless, simplifying your processing and reconciliation. Customise your guaranteed FX rate period in advance –choose any period from mere minutes to up to a week, depending on your business needs. Give your cross-border customers price certainty with minimal cost and short integration timelines. Why Multi-Currency Pricing (MCP) Matters to eCommerce? Aladdin makes it easier and risk-free for merchants to offer local prices to their online global customers, without the consumer needing to leave their eCommerce platform to check for external FX rates, and therefore increasing sales conversion rate. Clear majority of online shoppers prefer to make purchases from local websites. Product search can occur on an international website, but purchases are made on locally priced websites. Online shoppers leave the international website to calculate exchanges rates before deciding to purchase. Customers are less likely to revisit single-currency pricing websites. Customers are more likely to spend more money on a MCP website. Most online shoppers are concerned about how much they are paying for FX when shopping in foreign currency. Does your solution provider provide a guaranteed rate to eliminate FX risk? Aladdin enables your merchants or counterparties to price in and settle in their local functional currencies. Consumers see and lock in their home currency cost at the point of sale. Is a guaranteed rate easily traceable and auditable? Is the rate competitive? M-DAQ’s proprietary FX algorithm provides access to quality pricing unparalleled in the industry. How long does your solution provider guarantee a rate? Aladdin guarantees the price for 24 hours to 72 hours to give customers ample time for making purchase decision. Any refund or chargeback within 90 days will be processed using the original transacted FX rate. Does your MCP solution provide potential to include additional margin in FX rate, thus generating risk-free incremental revenue for you? We can work together to configure a FX margin which creates for you, a new revenue stream that would otherwise be captured by payment parties. Is your MCP solution fully automated and scalable? Can it support and process millions of transactions per day? M-DAQ has been powering local currency pricing for AliExpress.com for the past 24 months and is able to support and process millions of transactions per day.